You take out one annoying vampire in revenge, and now you have to clean up the mess? What a pain in the...something. Bethany Anne and crew are back! They need to grab a ship, figure out who is trying to dig into her businesses, get their hands around the potential for creating an AI and the ongoing mess with Anton and South America. One of these days, she will get a break. Fortunately for us, it wasn't today. Got an attitude? That's nice. Just don't show it around Bethany Anne. When she slaps a face off, the whole head goes with it. 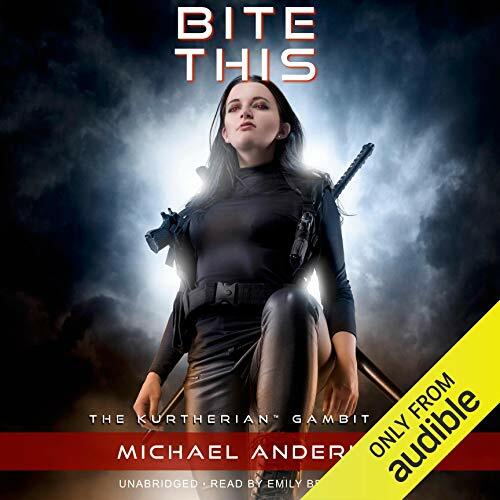 Bite This, book four in The Kurtherian Gambit series, follows the story after Love Lost. If you haven't listened to the preceding books, you pretty much have to. These are a series and many of the characters have been introduced in preceding volumes. All of the books in the Kurtherian universe have been interesting and well-done story-wise. We will NOT mention spelling, etc in book versions. You don't catch those in audio. Beresford does an excellent job with this book. Truly the voice of Bethany Anne. I've been reading the ebooks as released and now buying the audio version, also. Thanks, Mike & Co! The series keeps getting better and better as it goes on. And again Emily Beresford shines and gives a stunning performance. A friend of mine recommended this series, he told me I reminded him of the main woman... now after listening to the series up book 4 so far I'm sure it was a compliment. So happy to have come across this author and series. I haven’t had this much fun with a book series since The Iron Druid Chronicles. Well done Michael Anderle and a superb choice of Emily Beresford for narrator. Holy flying jock licking , fucktard on a pogo stick ! I may be a sweet little old grandma , but damn I wish I was on BA'S TEAM ! Too much nurse in me to kill , I think . I could do the patching up after ! just found this series , but you are now up there with Ann Rice , and Dianna Gabledon in my opinion ! keep it going ! Love the entire series I have read so far! Michael Anderle, just a heads up. I read all your books on Audible, and the Audible App has your main story line in two differnt series. 'The Kurtherian Gambit' (Forever Defend; Might Makes Right; Never Submit; Never Surrender; Bite This)) and the 'Kurtherian Gambit Universe' (all the other audio books). Just thought you would want to know so you can fix it with Audible/Amazon! Finished 4th in the series. Still five stars!! I have found the series to be consistently excellent. This book is no different. The story line is engaging. How can you miss with vampires, sci fi and action with characters you would gladly fight along side and share a beer. Great writing and great narration combined in a great Highly recommend! I am cutting off the rest of the review, because I selfishly want to start book 5 ASAP! When the vampire queen is tearing through her enemies, what should come to her aid but a German shepherd to help tear out throats! The team is growing! A long journey starts with one step. This series is building an impressive and interesting story arc one step at a time. For each step the suspension of disbelief needed to enjoy a stir happens easily. If you like science fiction with everything turned up to eleven, on the vast balance of probability, you will be captivated by this. why do i have to wait for book 5? i have finished these 4 books in a week. any chance of releasing these a bit faster? loving this series. Love the escape. Thankyou for introducing me to your world.